Economic development needs an alignment between 'power and identities'. The leadership has a moral responsibility to see the rest of us as "equal partners" in the national dialogue- Uche Okeke. Poor countries must overcome obstacles that prevent them from poverty to prosperity by addressing inequality and inclusivessness, instead of reckless policies of discrimination and division; "Better together".Sadly, this is not the case. There is a growing demand to restructure the current political system which portends obstacle to economic development in Nigeria. Political and economic leaders have become vocal voices in this regard. "APC manifesto promised us restructuring so what is holding us"?-Prof. Chukwuma Soludo. But the current leadership believes in the execution of the status-quo, instead of admitting the mistakes of the past, make peace with the present and address the problems of the future. "There is a saying in the sixties that we must go on with one-Nigeria"-President Muhammadu Buhari . This is the "exploitative" slogan that have defined our polity- a coherent and dominant strategy of power. By this declaration "Identity dynamics" constitute power in some places while 'Power dynamics' shape identity somewhere else. See the case of Rotimi Amaechi vs River state, recent elections in Edo state, Ondo state and other re-run elections where indigenous people are used as resource for power; the federal government manipulates the outcome of the elections in those states using the federal might and federal agents. One commentator said the Ondo state governor-elect did not thank the people of Ondo state for voting him into power, but he thanked President Buhari for helping him to come to power. Even the ruling party APC was bold to tell their regional party chief, Bola Tinubu that they can win the state election without him. Using indigenous populations as resource for power creates chaos in those states thus affects economic development. You cannot expect economic development in a state of anarchy. The truth is that the present political system only creates a situation where there are permanent winners and permanent losers of which Ndi-Igbo(minorities) are permanent losers. The only way for Ndi-Igbo to have a voice in the system is by seeking a regional alternative which is aligning to APGA, or any political party that grants them access to opportunities that will enable them improve their lives. 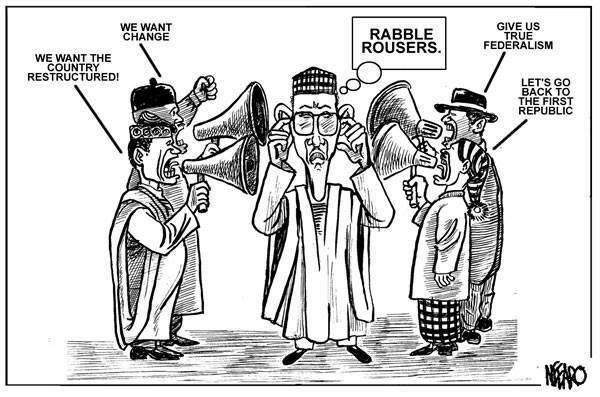 "The party that creates the best conversation about economic freedom, employment, skills development and inclusiveness should be favoured"
Restructuring the present political system is the only way to defuse a lot of uncertainty and anger that has led to the rise of IPOB, Niger-delta militants, SHIA Muslims, etc. The 1999 constitution was designed to empower only a section of the population using the instrument of the centre. The current administration should find constructive ways of allaying the fears of the people instead of intimidation and harrassment, the same strategy and ideology that has created the mess. This will be a great legacy. Addressing inequality and inclusiveness, not reckless policies of discrimination and division. Economic development needs 'an alignment between 'power and identities' . It's our desire for our government to make the right choices that will put the country on the path of growth. Victory comes with responsibilities. Ignorant minds are misled into believing that corruption is the only impediment to our national development, sadly it's not. No doubt, corruption affects development but the major issue is to address the 'exploitative relationship' that has defined our union which led to corruption and constantly questions our sense of national loyalty. Don't be deceieved by political rhetorics of labelling people critics another exploitative and divisionary slogan to cause disaffection and divert public attention from the critical issues of our time. The Government has a moral responsibility to see the rest of us as "equal partners"in the national dialogue ,promote inclusiveness and discourage policies that create division. What is the sense of being one country and the sense of national loyalty? Why National divisions? How can we overcome obstacles and become prosperous, these are questions i set out to find the answer, probably in the new year.